Categories: Community Events, Classes/Workshops, Misc. The Chesapeake Bay Bridge is a key artery that moves people and goods throughout the state, keeping Maryland’s heart pumping. Unfortunately, increased traffic has clogged that artery and continues to hurt Marylanders from the perspectives of business, quality of life, and more. From beach travelers to daily commuters, all would benefit from a suite of solutions reducing traffic congestion as soon as possible. Now is the time to have that conversation. 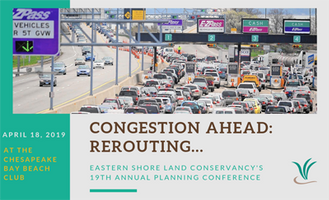 Fittingly held at the Chesapeake Bay Beach Club with the bridge as a backdrop, ESLC’s 19th Annual Planning Conference will stimulate conversation around ways to reduce traffic congestion today. Through interactive panel discussions and keynote speakers, guests will leave with a better understanding of this regional issue and the possible solutions for traffic congestion. Attendees should come with an appetite for stimulating discussion…and delicious, locally sourced foods!